We spent a really fun day at the beach with the kids' aunt & cousins yesterday. It was one of those perfect days where the sun was shining and yet it wasn't too hot or too cold. There were no clouds in the sky and the waves were rolling in. I find it to be so relaxing and rejuvenating. 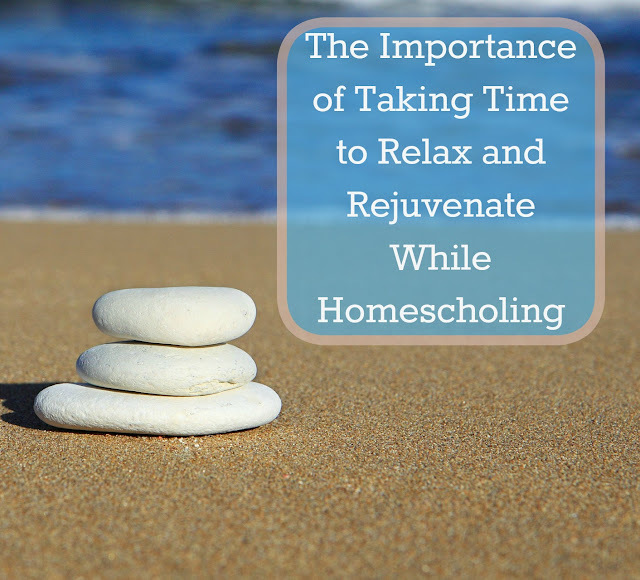 It is so important to find time to relax and rejuvenate when homeschooling otherwise it's easy to get burned out. I've had a tough couple of days feeling really stressed out, not sleeping and stewing over things that have happened and our day at the beach was just what I needed. I felt like I had been a pretty cranky mom for the past few days and was looking for way to re-set and move on. I'm pretty sure the kids needed a day like that too. We've been stuck in the house with some cooler & rainy days and they had been at each other's throats. They were able to spread out, dig huge holes in the sand, play games, go in the freezing cold water, boogie board, and just relax and have fun. They tried to "fly" their boogie boards like kites (the beach was pretty deserted for a good portion of the day). They also organized a long jump contest between them and made up numerous games. They tried running from the waves, jumping over them, rough housing and ended up having a great time. We ditched the schoolwork completely and relished an entire day off. I'm sure there was learning happening but I didn't even bother to watch for it and we just had fun.